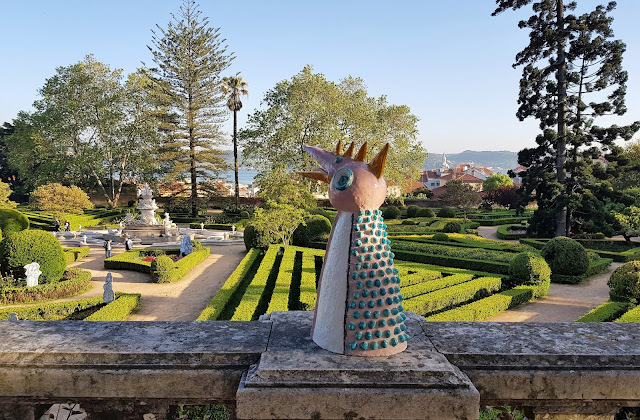 My first visit to the Jardín Botánico da Ajuda was in June 2017, when I posted a few pictures as I holidayed through Portugal. 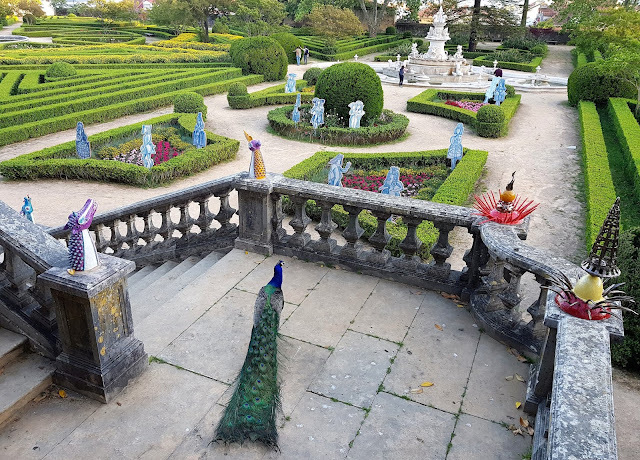 My second visit was in May 2018, armed with expert advice on the history and restoration of this striking botanic garden from a talk by Cristina Castel-Branco, Ana Luisa Soares, Teresa Chambel and Francisco Rego at the European Botanic Gardens Congress, EuroGard, held in Lisbon. Jardín Botánico da Ajuda was Portugual's first 'scientific' botanic garden, established in 1768 by the Italian naturalist Domenico Agonstino Vandelli. 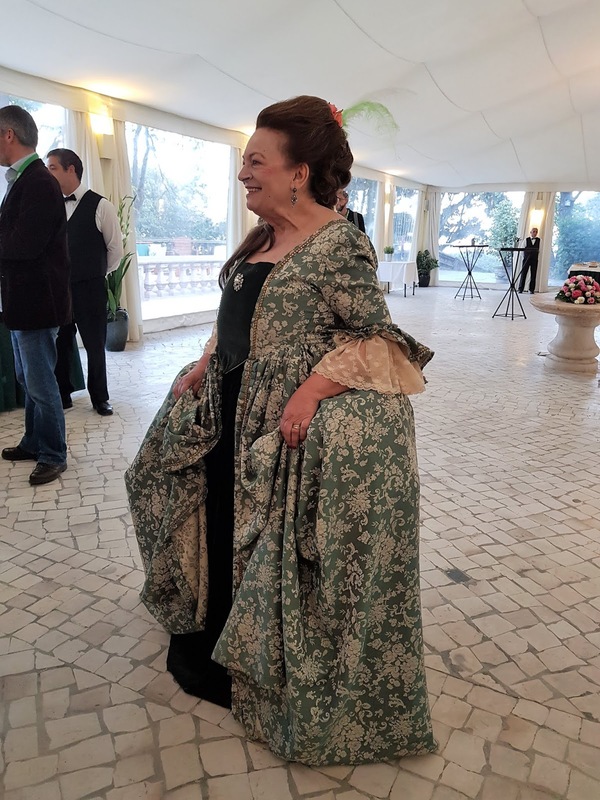 Born in Venice but living most of his life (and dying) in Lisbon, Vandelli wanted to collect and grow plants from throughout the extensive Portuguese empire. This struggling Dragon Blood Tree (Draceana draco), perhaps from the nearby island archipelago Madeira, was planted about the time the botanic garden began. 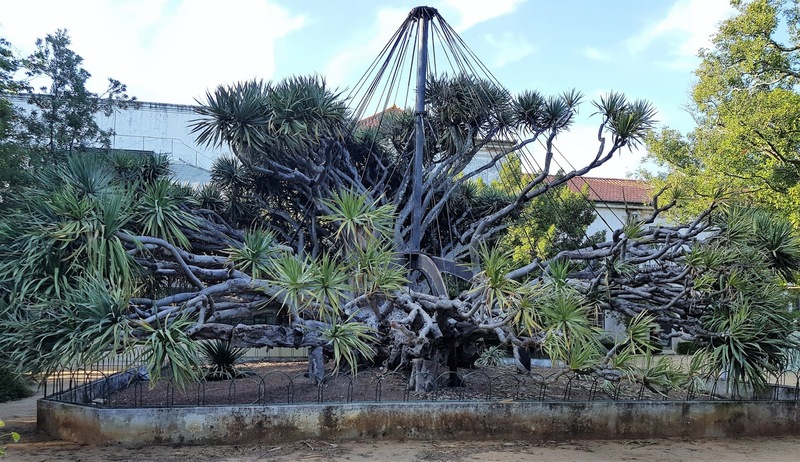 Based on its deterioration over just the last 12 months (compare this image with the one I took in June 2017) I'd suggest 250 years is about the life span of this plant in cultivation. The pair of Ombú (Phytolacca dioica) I admired last time are doing much better. The botanic garden is only 3.5 hectares in size but packs a punch. 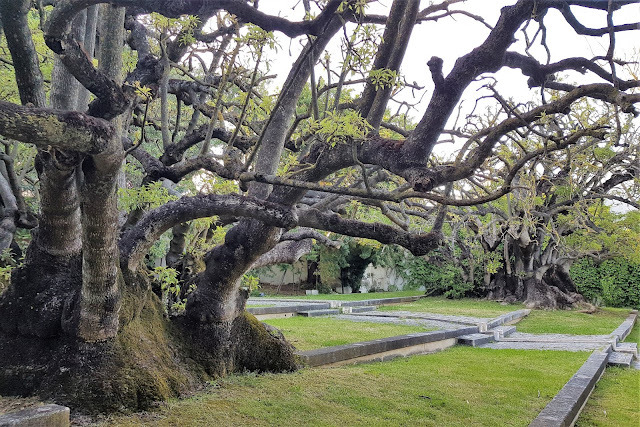 It's divided in two, with a very formal parterre on the lower level and an assortment of specimen trees and small boutique gardens nestled beside a glasshouse on the upper. The entire garden has been lovingly restored over the last two decades so what I saw last year and this year is a long way from what visitors have experienced through the latter half of the twentieth century. The site works well as a place for growing exotic plants. It's sheltered from prevailing winds and has plenty of water available for irrigation. The basalt substrate add stability: for a few decades the country's royal family lived in a wooden hut (aka 'Royal Shack' or 'Royal Cabin') on this site after the Royal Palace was destroyed in the 1755 earthquake. In 1768 the botanic garden that we see today took shape, a combination of Italian parterre and enlightenment plant collecting. At the time it was a popular destination for locals, who would have looked a little bit like this. Through the next century it became more of a 'pleasure garden', then in the twentieth century a little more 'picturesque' (that is, more like a landscape painting). Fast forward to 1993 though and there are only 600 visitors each year, almost certainly not as well dressed, the garden was hardly maintained. Cristina and her crew stepped in, employing a head gardener born in France but trained at Kew Gardens, Emmanuel Speck. 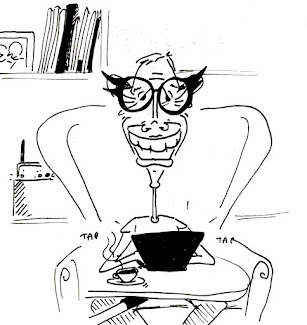 He stayed for two years, helping to establish the quality of horticulture they expected. 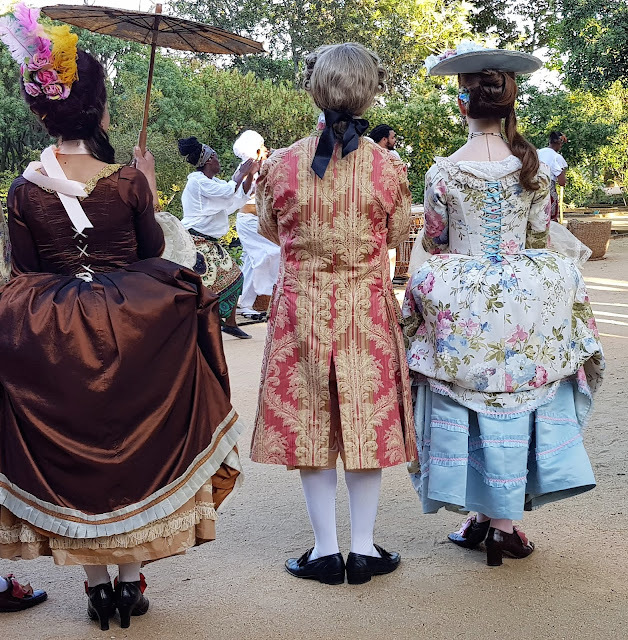 They decided to revert to the 1768 plan, bearing in mind that an old botanic garden, like any garden, will often have many changes made to its design since inception and no one is intrinsically more worthy than another. There were a couple of more modern additions, such as an aromatic garden for visually impaired visitors and the conversion of the glass house into a restaurant (where the Prime Minister of Portugal was married, and the delegates from the conference gathered for drinks). 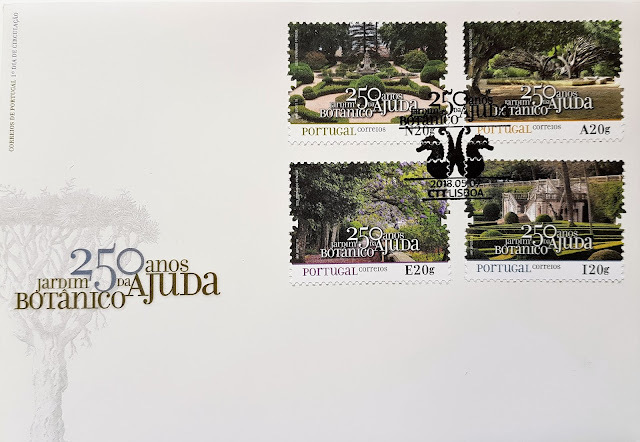 For the anniversary celebrations in 2018 there were various events and activities, including a set of stamps to commemorate the occasion. For the younger readers, these were a kind of currency used to send emails before we invented computers and smart(alec) phones. 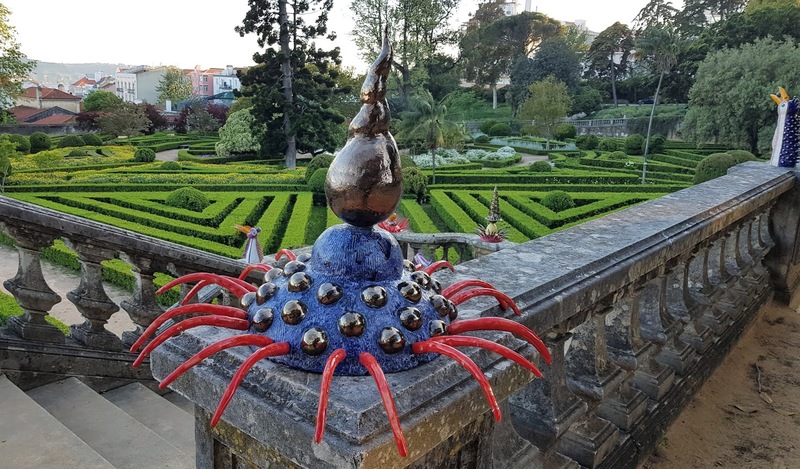 While a key tenet of the restoration was to avoid 'dissonance', for the 250th year there was a cheeky 'intervention' of ceramics by António Vasconcelos Lapa. His Viagem ao Barroco ('Voyage/Journey to the Baroque') worked extremely well I thought.